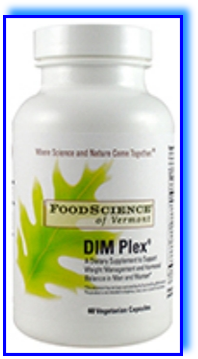 DIM Plex is a dietary supplement to support hormonal balance and weight management in men and women. Its distinctive ingredient, diindolylmethane, is the plant indole found in cruciferous vegetables (such as cabbage, broccoli, Brussels sprouts, and cauliflower) which has been found in scientific studies to be cancer inhibiting - in large part through hormone modulation. Other ingredients: gelatin, food grade starch, tocophersolan, vegetable stearate, silica. : As a dietary supplement, take 2 capsules in AM with mid-morning snack for the first week. Then take 2 capsules in AM with mid-morning snack and 2 capsules before 3 PM with afternoon snack. If pregnant, nursing, or planning to become pregnant do not take this product. Keep out of reach of children. Store in a cool, dry place.